This restaurant London Broil Recipe is one of my husband's favorite ways to eat beef and it has always been a favorite restaurant recipe. 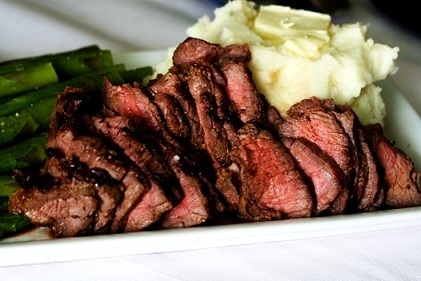 The history of so-called "London Broil" is unknown. It has no connection to the City of London. Also, knowing how to slice "with the grain" is critical. Preparation time: 10 minutes. Enough to marinate 3-4 pounds meat. To have a really good grilled vegetable recipe to accompany your London Broil, click on its name and enjoy! Maybe you'd enjoy having some fabulous garlic mashed potatoes. And what's for dessert? How about Apple Crisp! Thanks for finding the website and this really delicious, but easy, London Broil. Enjoy your London Broil and the company you share it with. As with all these restaurant recipes, you can cook with confidence and style. Did you know? In parts of central Canada, a ground meat patty wrapped in flank or round steak is known as a London broil. 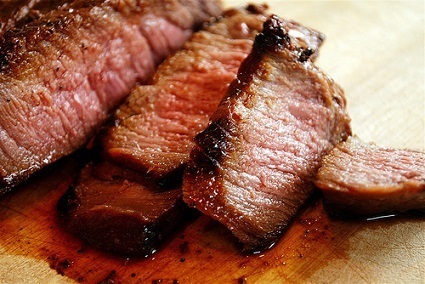 Some butchers will wrap the flank steak around a concoction of seasoned and ground or tenderized flank steak. Others sell a pork sausage patty wrapped in flank or top round steak labeled as London broil.